Andhra Pradesh State Road Transport Corporation (APSRTC) has come up with a new recruitment notification to recruit for Driver and More Vacancies post through this recruitment notification. The Andhra Pradesh government always having some new updates and now APSRTC brings opportunity for those who are willing to join as a Driver position for the government bus services. Who Can Apply? The candidates who have completed 10TH, 12TH, ITI for the post of Driver and More Vacancies. 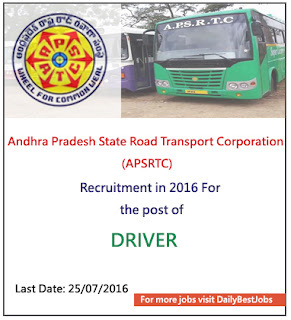 Andhra Pradesh State Road Transport Corporation (APSRTC) is planning to recruit 154 candidates for the post of Driver and More Vacancies. Interested and eligible candidates can apply before 25 July 2016. Andhra Pradesh State Road Transport Corporation (APSRTC) proposes to receive the application from applicants in Offline Mode. Eligibility: Eligible candidates can submit their application to Andhra Pradesh State Road Transport Corporation (APSRTC) before the 25 July 2016. Find the below for more information like Age Limit, Eligibility criteria, Salary, Total vacancy, Selection Process, Job details, last date, Application process and other useful details. Read carefully all the below details before applying your application by offline. Address for this job: Andhra Pradesh State Road Transport Corporation (APSRTC), Tirupati. APSRTC that's Andhra Pradesh State Road Transport Corporation is the state owned road transport corporation in the southern Indian state of Andhra Pradesh. They brings job opportunities for the peoples who wants to join as a driver and provide road transport services to public of the state of Andhra Pradesh. (a) The candidates can apply on or before 25 July 2016 for this job vacancy and recruitment. (b) There is no detailed information about the selection process is mentioned in the recruitment notification. The interested and eligible candidates can send their application along with all relevant documents to the Regional Manager, Tirupati Region on or before 25-07-2016 up to 05:00 PM. Candidates must remember the important last date to Apply for this job 25 July 2016.